Cashless transaction facility also available. Tickets Available: at IGCC 21 Jor Bagh, New Delhi- 110003 from Nov 19th 2018 and at the venue on the day. Event Description : OCCASION : German Christmas Market 2018. Highlights: The 21st edition of the capital’s much awaited and fun filled event showcasing an exclusive palate of interesting lifestyle products - designer home accessories, high end fashion wear, children's goodies & activities, stationery, garden accessories, delectable food items and beverages on sale. The event drew more than 12000 visitors last year from the international corporate Diaspora and the crème de la crème of the Indian business community. The highlights of the event are a Gingerbread House, German Rooftop Restaurant and Dessert counter, traditional German Christmas Food, a beautifully decorated Christmas tree, German Auto Giants, German chocolates, a live band in the evening, On-the-Spot painting competition for children, Christmas Choirs, Magic shows by German magician, and of course, Santa Claus! 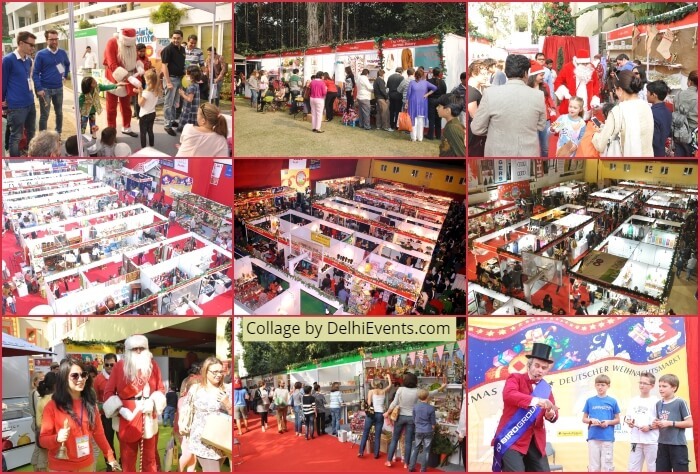 On display : Over 90 exhibitors will be showcasing choicest collection of Christmas decorations and other festive goodies, German food products, home accessories, Cosmetics, Handicrafts, garments, gift articles and much more.